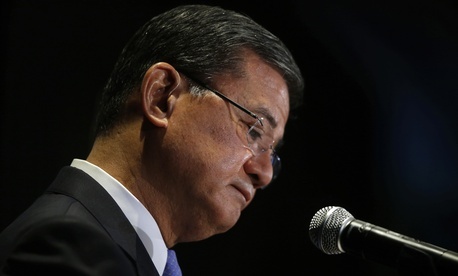 This story has been updated to reflect Eric Shinseki's resignation. Outgoing Veterans Affairs Secretary Eric Shinseki apologized Friday morning for the department's failures and announced he will remove all senior leadership at the Phoenix health care facility that has been at the center of a wait-list scandal that has engulfed the department. Shinseki also announced, at a speech before the National Coalition for Homeless Veterans, that no Senior Executive Service members at the Veterans Health Administration will receive a bonus this year. Later Friday morning President Obama announced Shinseki would step down. "I said when this situation began weeks to months ago that I thought the problem was limited and isolated, because I believed that," Shinseki said. "I no longer believe it. It is systemic. I was too trusting of some, and I accepted as accurate reports that I now know to have been misleading with regard to patient wait times.... I will not defend it, because it is indefensible. But I can take responsibility for it, and I do. So, given the facts I now know, I apologize as the senior leader of the Department of Veterans Affairs. I extend that apology to the people whom I care most deeply about—that's the veterans of the great country, to their families and loved ones who I have been honored to serve for over five years now as the call of a lifetime." Shinseki went on to extend his apology to members of Congress—nearly 100 of whom had called on him to step down—and to the American people. In discussing the nation's epidemic of homelessness among veterans earlier in his speech, Shinseki said he has done this kind of thing before. "Since 2009, VA has proven that it can fix problems, even big ones, with the support of our public and private partners," Shinseki said, even as a number of those partners, members of Congress and veterans groups, have called for him to step down. Shinseki also announced his support for legislation from Sen. Bernie Sanders, I-Vt., that would give him more power to remove senior officials at the department. The House passed similar legislation on a bipartisan basis last week. Shinseki met with President Obama later Friday morning, where the two sat down in the Oval Office to discuss Shinseki's internal review of the matter. The president then announced Shinseki would resign. Friday morning's developments come just two days after the inspector general released an initial review, finding that 1,700 veterans at the Phoenix facility remain on a wait list, where other veterans waited an average of 115 days for care.